The Purple Cat Winter Camping trip is November 5th – 8th. It is mandatory that the individuals going have Golden Strings listed as a provider for their waiver services. 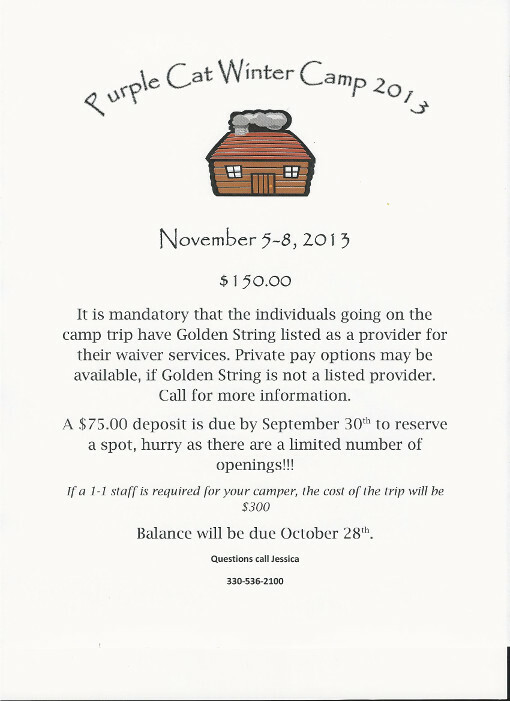 Private pay options may be available if Golden String is not listed as a provider. Call for more information. A $75 deposit is due by Sept. 30th to reserve a spot. Hurry, as there are a limited number of openings! If a 1 on 1 staff is required for your camper, the cost of the trip will be $300. Balance will be due by October 28th.